With knife held in slanting position, almost parallel to cutting surface, cut each chicken breast half crosswise into 1/2-inch thick slices. In medium bowl, combine soy sauce, sherry, cornstarch, ginger, sugar, and crushed red pepper; add chicken, tossing to coat. In wok or large non-stick skillet, heat 1 tablespoon oil over medium-high heat until very hot. Add green onions and red and green peppers and cook, stirring frequently, until vegetables are tender-crisp, 2 to 3 minutes. With slotted spoon transfer vegetables to bowl. Increase heat to high and add remaining 1 tablespoon oil to skillet; heat until very hot. Add chicken mixture and stir-fry until chicken looses its pink color throughout, 2 to 3 minutes. (I suggest cutting one of the larger pieces to make sure it is cooked through.). Return vegetables to pan; heat through. 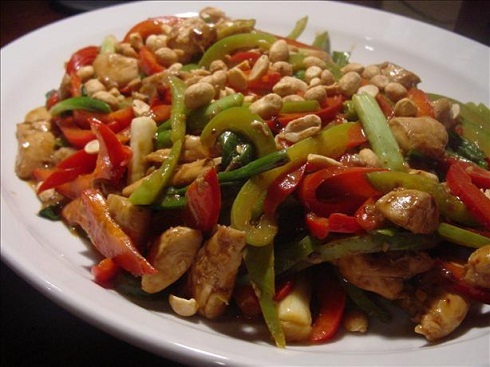 To serve, transfer chicken and vegetables to warm platter and sprinkle with peanuts.